Now there are no kids to test these on in our family, but we had so much fun dipping these pancake balls in syrup. And if we can enjoy these that much, I am certain your whole family will love them as well. And talk about cuteness. Food that is adorable always tastes 1000x better anyhow. 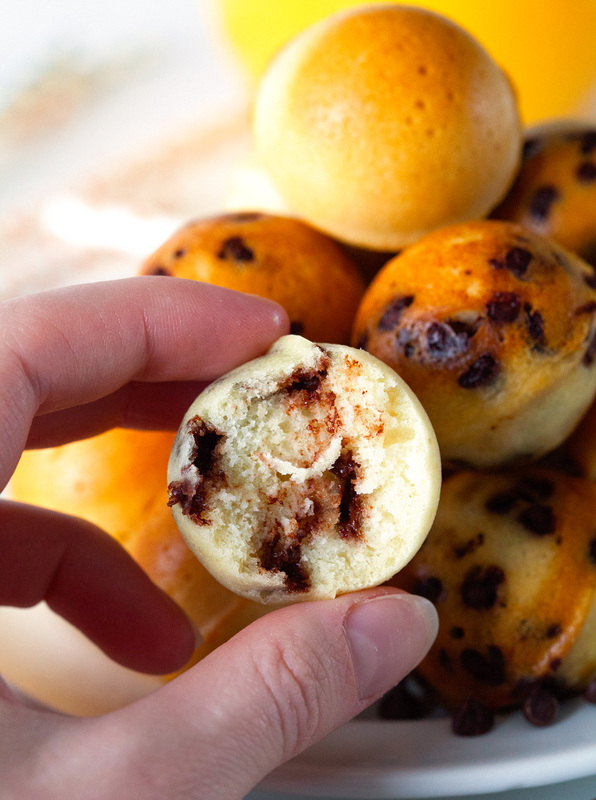 These Pancake Poppers were baked in a Cake Pop Pan. If you don’t own one, you could totally use a mini muffin pan instead. I am pretty sure I will never go back to standard pancakes for multiple reasons. The batter used in this recipe yields super airy and light pancakes. Once I prepared the basic batter, I beat an egg white until soft peaks formed and gently folded it into the pancake batter. It makes for the fluffiest little things. Also, you can have these ready in 15 minutes. 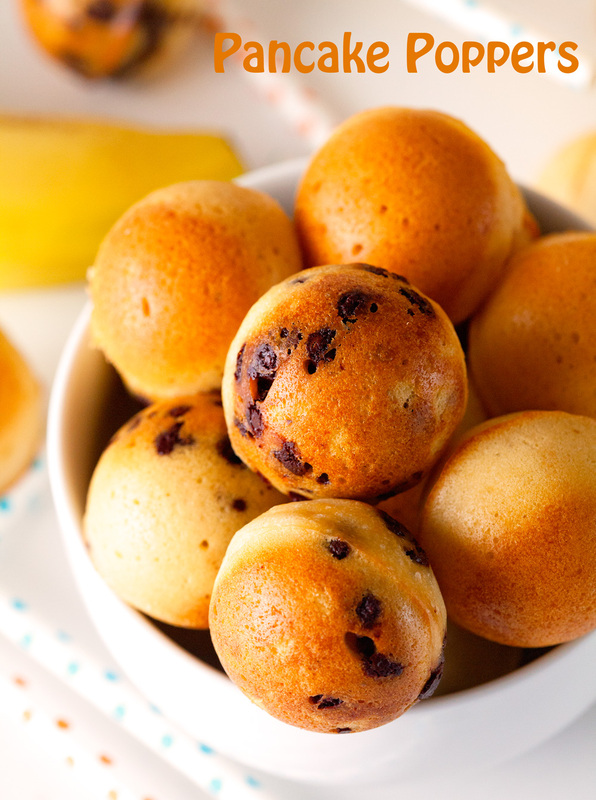 All of your pancake poppers will be done at the same time, no more waiting until you’ve cooked your first batch to move on to the next. Everyone will be able to eat fresh poppers as soon as they pop out of the pan, ha! And you can enjoy these any way you like. Chocolate chips, blueberries, plain like my husband loves them or any way you dress up traditional pancakes. The opportunities are endless. These would even be a great breakfast on the go when you’re running out of time, but still want to enjoy a good meal to get you ready for the day ahead. Yeah, you can probably tell how excited I am about these. I have thought this through. I made sure I could have them any time of the day in any way possible. They’re pretty much my new obsession. I hope they’ll be yours, too! Also, almost exactly 2 weeks until the first day of Spring. Yippee! 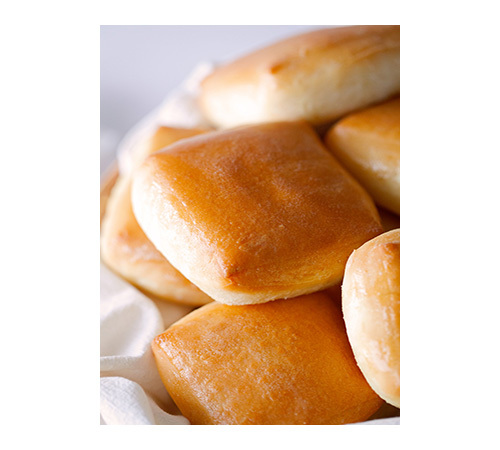 Enjoy your family's favorite pancakes in bite-sized form. 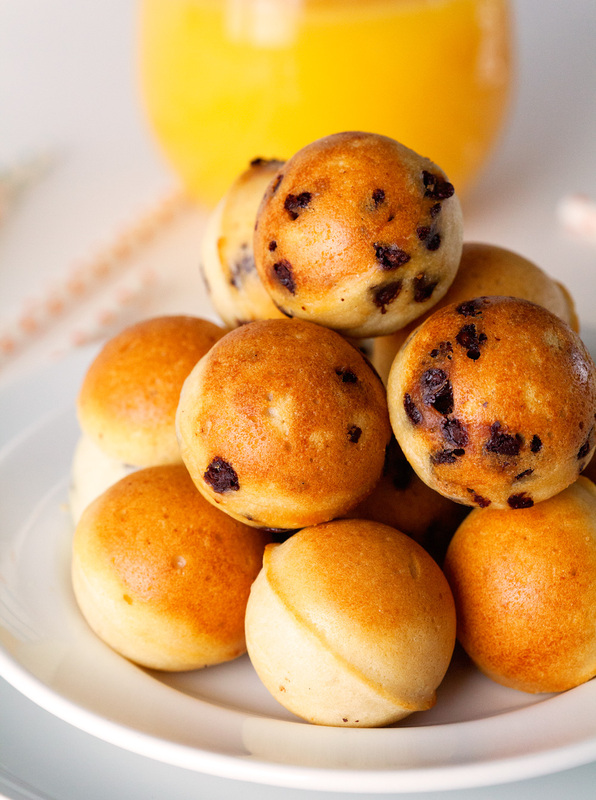 Pancake Poppers are light, fluffy and oh so cute! 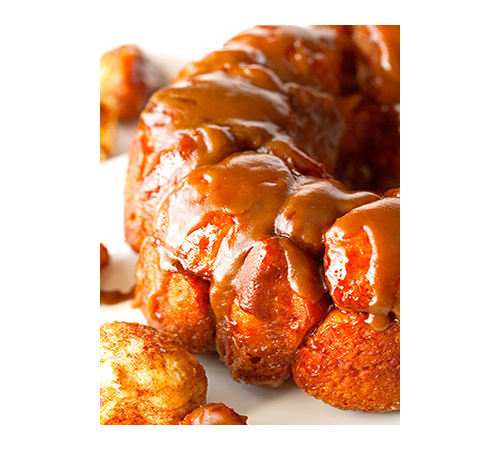 Preheat oven to 375 degrees F. Spray a cake pop or mini muffin pan with nonstick cooking spray. Set aside. 1. In a bowl, combine the flour, baking powder, salt, and sugar. Add the milk, 1 whole egg, vanilla, and melted butter. Whisk until mostly smooth. Don't overmix. It's okay if some lumps remain. In another bowl, beat remaining egg white until smooth peaks form. Gently fold into batter until incorporated. 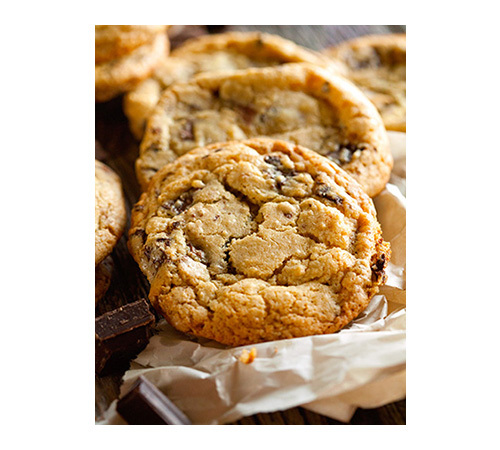 Add mini chocolate chips, if using. 2. Using a cookie scoop, fill each cake pop mold or muffin cup with pancake batter (fill it almost all the way) and place in the oven. Bake for 12 minutes or until a toothpick inserted in the middle comes out clean. 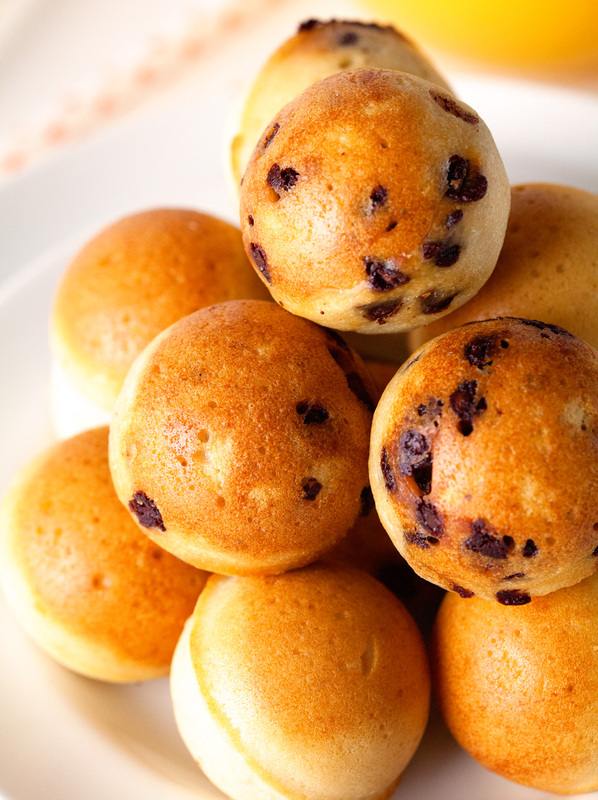 Immediately invert pancake poppers onto a wire rack and let cool for 5 minutes or until they're safe to handle. Serve with your favorite toppings. 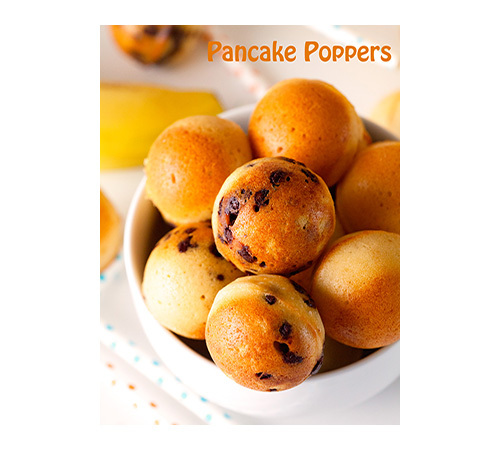 Pancake Poppers are best enjoyed on the same day. These are too cute! When the page first loaded I thought I was looking at a bowl of clementines. I bet my kids would pop the entire bowl without a second thought! Thank you so much, Melanie. Hope your kiddos will love these. 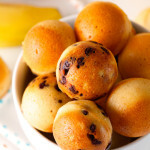 Pancake poppers – what a great idea! I looooooove pancakes and am always trying out new variations. I will have to try these! So cute! Pinning! Since you love pancakes as much as we do, you should definitely try these. So fun and delicious! Thanks for the pin! I totally agree, Chelsea. Thank you so much as always, sweet lady! Kathi, these are SO cute! Every Saturday morning, by the boys’ request, we have pancakes–or pan-pakes as my two-year-old calls them! I could see them flipping over these poppers. And you can bet dunking them in syrup would be their favorite! You must have the cutest kiddos – “pan-pakes” just melted my heart :). If the big kids go crazy over these, I am sure the little ones will too, ha! That’s all I was trying to do – figuring out how I could have pancakes as I’m leaving the house :). Thank you, dear!! Kathi, we are huge pancake fans here at my house, too! And, these are so fun! I’m putting this cake pop dilly in my Amazon cart right now! You’re so creative! Ha! I really hope you enjoy these, Gloria! Let me know how they turn out. I’d love to hear. And thanks a million for your sweet comment!! What a fun breakfast treat! Thanks for linking up with What’s Cookin’ Wednesday! Thank you so much, Karly! And thanks for hosting. I really appreciate it! This is such an awesome idea! These would be a hit at our house! 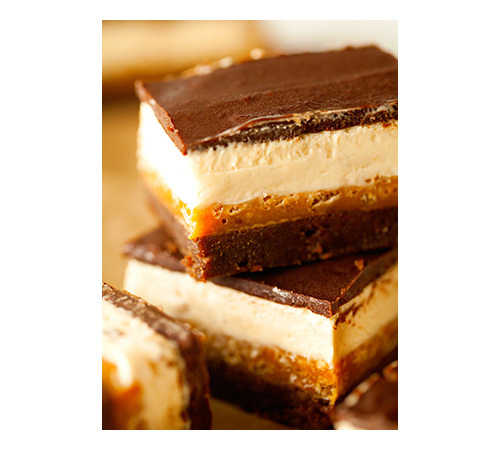 These look so good – I know they’d go over well at my house! My husband makes the pancakes, so I will have to share this with him! Pinning right now! Thank you so much, Michelle. 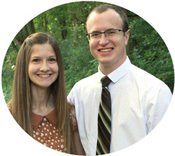 I hope your family will love them and thanks for pinning!! Let me know what your hubby thinks – I’d love to hear! 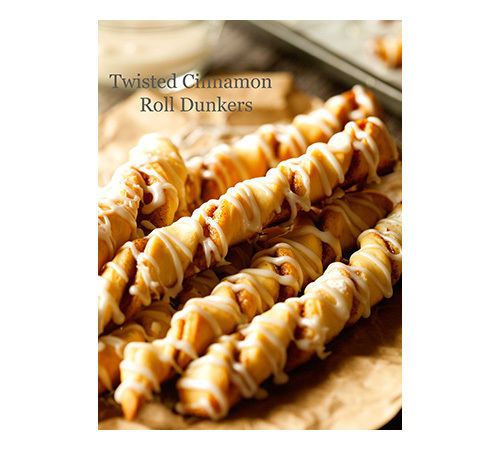 Instead of dunking these fun little poppers, do you think adding the syrup in the batter would work too? I’d love to take these on soccer trips(we’ve had some pretty early ones),but I’m not willing to take the chance of having sticky syrup on my car. Even if my kids are teens. One bump just right…. Haha. I totally understand. I have never tried that, but I think that adding syrup to the batter could definitely work. I’d probably substitute the sugar for the syrup to begin with it and see how they turn out. Hope that helps and have a wonderful soccer season!! Those are so cute!! And I love that they are all ready at the same time. That’s the part about fun, family breakfasts on the weekend: it’s hard to sit down and eat together. You are so welcome, Allyson. Thanks for letting me know that you liked them so much. Love that you made different kinds, too. Hope you had an amazing weekend!! So, are these Cake Pop Pans the silicone ones or is it a cake popper machine? 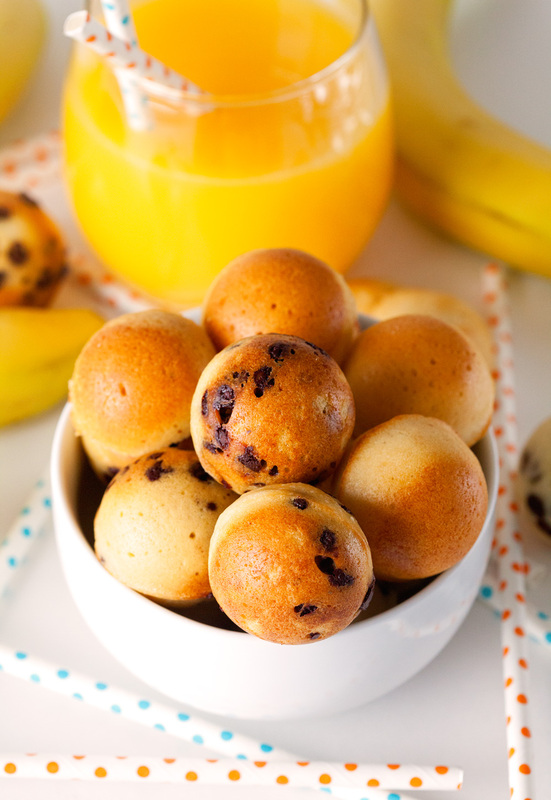 These Pancake Poppers look so cute and yummy!! These are an awesome idea..need to make them grain free or my family. This recipe works perfectly in a cake pop maker! Perfect round balls! the first recipe that has produced full balls in the cake pop maker! amazing! A question (or two) i mAke cupcakes almost every day and always look for something new. These look wonderful! I’d like to, try the recipe as 12 cupcakes. I do not have a mini pan and am not likely to find one in the third world country where I live. Do you think they would not collapse? Also I do not have unsalted butter. Is there a noticeable difference in the result? 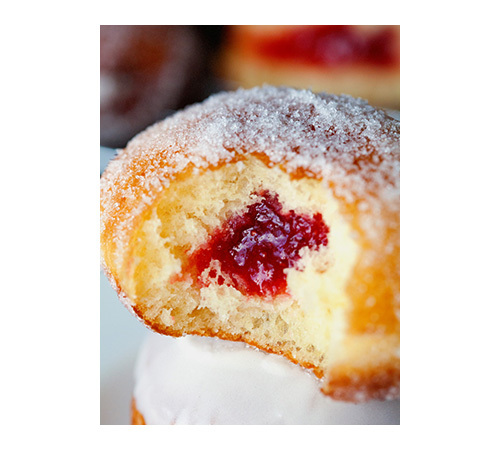 We tried them with a mixture of cream cheese and raspberry jam. Oh My! Hello! These are going to be perfect for my daughter’s sleepover breakfast. Can I make the batter the day before? Thanks! This batter is best when made the day of. It can sit for about 30 minutes, but not any longer than that. Hope that helps! I am turning my 15 year old daughter onto this idea! She has her own cake pop machine & pans for the oven & loves any reason to bake, maybe it’s time for Brinner at our house tonight! Thanks for sharing, I have pinned this for future use! 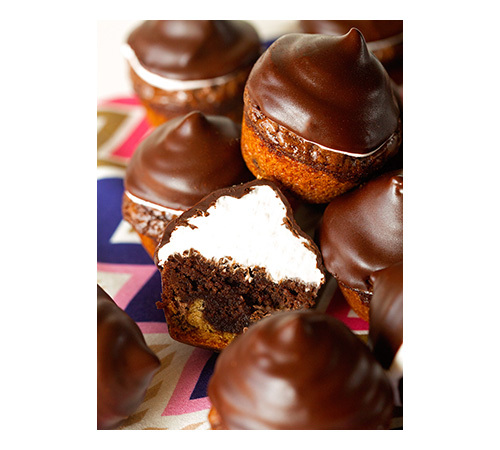 I tried these using a mini muffin pan and they were awesomesauce! Better than actual pancakes! The only thing I would say is that it’s good to flour the chocolate chips first so they don’t all sink to the bottom while baking. Before I run to the grocery store, can you use pancake batter instead (with eggwhites)? I don’t have a cake pop pan, but I would love to make these. Would it work if I used my doughnut iron to make these? WILL TRY GLUTEN FREE, SO MANY ARE GLUTEN INTOLERANT. LOOKS TASTY! TY! These pancake pops were perfect! I made them in my cake pop maker my husband and I got for our wedding and the pops cooked perfectly! So moist in the middle, and the reCope made the perfect amount I needed! Thank you! I consider myself a very good pancake maker. Though I have a no-fail recipe, I’m always looking for something new. I had plenty of blueberries on hand and figured I’d give this a whirl. The batter was so runny I knew it wasn’t going to cook right. I ended up trying to save the batter, but it produced gummy pancakes that my kids ate, but I could barely choke it down. The blueberry sauce was sickeningly sweet. Gross. Just popped these in the oven; crossing my fingers that they turn out! Thanks for the recipe Kathi! We’ve made all varieties: sprinkles, snickerdoodles, choco chip, raspberry. So many options! Just tried this recipe EXACTLY as written, with the exception of using the baking spray with flour added (used plain baking spray in large quantity). This is a fantastic recipe. Fed 7 girls post-sleepover with a single recipe. I forgot to spray the pans in between cooking 2 batches, and the pancake-pops stuck to the bottom horribly, so remember to spray your pans in between each batch!!! Thank you so much for sharing this recipe. Will be using again! Can I freeze and pop in microwave for rushy mornings? Thinking of trying these for my daughter’s sleepover. What’s up,I read your blog named “Pancake Poppers” on a regular basis.Your writing style is awesome, keep it up! And you can look our website about free proxy.